October 30, 2009: Happy Halloween! Today is our traditional Halloween Game Day! We'll be playing games, eating way too much sugar, and trying to navigate the office with costumes on. What that means for you, our loyal fans, is a slight delay on responses. We'll be checking email and dealing with burning emergencies, but most things we'll let slide until Monday. This "office outage" includes Warehouse 23. As always, e23 can automatically process your order and deliver PDF files to your inbox. 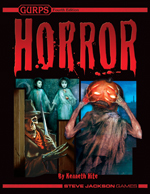 In fact, Dr. Kromm just mentioned a bunch of scary-themed GURPS books here. Have a fun and safe All Hallows' Eve!